Another week, another great 7 days in the big data industry! The conference season (which is now pretty much the whole year) is heating up and I already took in the tech-cool H2O World conference in beautiful San Francisco (check out my up-coming Field Report for details). For now, let’s dig into some scuttlebutt starting with some new M&A news … Kofax®, a leading supplier of Intelligent Automation software to automate and digitally transform end-to-end business processes, announced it has entered into a definitive agreement to acquire Top Image Systems™ Ltd. (NASDAQ:TISA) (TIS), a global innovator of on premise and cloud based applications that optimize content-driven business processes. In new funding news we heard … Databricks, a leader in unified analytics and founded by the original creators of Apache Spark™, announced it has secured $250 million in a Series E funding round led by Andreessen Horowitz. Coatue Management, Microsoft, and New Enterprise Associates (NEA), also participated. This most recent round of funding brings Databricks’ total amount raised to $498.5 million. The rapidly growing global demand for Databricks’ Unified Analytics Platform led the company to exceed $100 million in annual recurring revenue during 2018 and experience approximately 3x year-over-year growth in subscription revenue during the last quarter of 2018 … KenSci, a Machine Learning and Artificial Intelligence powered, risk prediction platform for healthcare, announced that it has closed $22 million in Series B funding. The funding round was led by Polaris Partners and witnessed strong participation from all existing investors including Ignition Partners, Osage University Partners, and Mindset Ventures. UL Ventures joined the round as a strategic investor, offering global reach and compliance expertise. The investment will further accelerate KenSci’s product roadmap and global expansion. 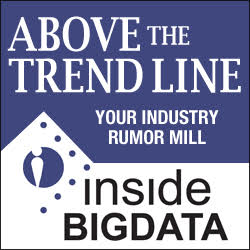 People keep moving in the big data industry starting with … Alation Inc., the data catalog company, bolstered its leadership team with the appointments of Raj Gossain as senior vice president (SVP) of product and Junaid Saiyed as vice president (VP) of engineering. As SVP of product, Gossain will lead product strategy and development of the award-winning Alation Data Catalog. As VP of engineering, Saiyed will lead the engineering organization, a growing team that now includes a burgeoning technical center of excellence in Chennai, India. The new office is well positioned to create a pipeline of technical talent, with a location in the heart of Chennai’s technology sector and engagement with the nearby IIT Madras, a nationally renowned technology institute … Infoworks.io, a leading provider of software solutions for agile data engineering, announced that it has named former AT&T Chairman and CEO David Dorman as Chairman of the Board. The company also announced separately today that Buno Pati has been appointed as CEO, moving from his prior role as Executive Chairman, and co-founder Amar Arsikere has transitioned from CEO to Chief Product Officer and CTO. Mr. Dorman is presently Chairman of the Board at CVS Health Corporation and a member of the boards at Dell Technologies and PayPal Holdings, Inc. He has previously served in various executive leadership roles in the telco industry, including Chairman and CEO of AT&T; Chairman of the Board of Motorola; Chairman, President and CEO of Pacific Bell; and President of Sprint Business. In the new partnerships, alignments and collaborations category we learned … Gimmal LLC, a leading provider of records management and content governance software, is pleased to announce its formal partnership with BA Insight. BA Insight provides AI-driven enterprise search software that delivers more efficient, personalized, and relevant user experiences. This new partnership will allow Gimmal’s advanced records management and content governance software to be joined with an AI-driven search platform that provides a modern, web search-like experience throughout numerous content repositories … FactGem, a leading data analytics technology company, announced a strategic partnership with Memgraph, a data analytics company based in the United Kingdom, to offer clients access to high-performance, next generation Graph database scaling. The partnership now allows clients real-time, more comprehensive data availability and analysis. By combining FactGem’s Data Fabric, which is based on Graph technology, and Memgraph’s next generation Graph Database, clients with even the largest datasets will be able to connect consumer behaviors and preferences to pivot business decisions in real-time. By integrating all available data and joining typically disconnected silos, clients can react to customers’ purchase points even faster, to create loyal and repeat business … Anodot, the autonomous analytics company, and digital operations management platform, PagerDuty, announced their strategic collaboration as integration partners to ensure customers benefit from true self-service detection, providing accurate alerts of business incidents in real-time. As integration partners, PagerDuty and Anodot collaborate to bring joint value to customers, delivering an unparalleled digital experience with real-time insights and detection. With PagerDuty’s real-time operations management and Anodot’s real-time incident detection, this partnership will enable customers to constantly stay one step ahead of damaging business events, before costing companies significant ROI … data.world, the platform for modern data teamwork and the collaborative data community Square Panda, the Silicon Valley-based educational technology company and maker of an award-winning phonics learning system with multisensory play, recently partnered together. Data is central to any organization’s and team’s workflow. But to deliver on its mission to help children learn through research-based curriculum, it is critical. Due to the small size of the Square Panda team, many people play many roles and need to work quickly to solve problems as they come. They need to be agile and nimble. Monitor data and react to market signals immediately to stay ahead of the game. This is why Square Panda partnered with data.world to ensure these key items got done correctly, effectively and efficiently. In new customer wins news we heard … Snowflake Computing, the data warehouse built for the cloud, announced that TriNetX, the global health research network that revolutionizes clinical research and enables discoveries through the creation of real-world evidence, uses Snowflake to easily and safely store and share data with it customers, accelerating research that can bring new therapies to market sooner. TriNetX is the global health research network founded on the idea that incorporating real-world data results in better clinical trial design, improves the site selection process to expedite time to market of new therapies, and creates Real World Evidence (RWE) to advance the collective understanding of human health … TigerGraph, the fast graph analytics platform for the enterprise, announced that OpenCorporates, the open database of companies has chosen TigerGraph as its backend graph database. The move enables OpenCorporates to better support investigative queries over its open database containing records on more than 170 million companies. OpenCorporates’ mission is to make information on the world’s companies more usable and accessible for the public benefit. The organization enables web-based search and offers a number of tools to data journalists via its Application Programming Interface (API) to help them find, extract and connect large numbers of companies in automated workflows. The result is substantially reduced time, better performance and the ability for deeper analysis (multi-hop) to support investigative tasks, as users can leverage automation with simple computer scripts to uncover tremendous hidden connections within data in OpenCorporates’ ever-expanding data sets. Below is a video describing JUMP Deep Recommender™, a recommendation tool for movies, series, TV channels and live TV events based on image recognition and natural language processing. It uses just in-content data to make compelling video recommendations and improve audience engagement. Deep Recommender™ is part of the JUMP Data-Driven video product suite – a business analytics solution for video service providers. The product suite delivers valuable insights about audiences and content performance, predicts churn to retain users, identifies clusters that video users belong to, and personalizes the video experience through data. Deep Recommender™ harnesses some of the most advanced Big Data and Artificial Intelligence technologies available to meet the needs of the video industry. And finally, we learned that Fusemachines Inc., a leading provider of bespoke AI solutions, software and educational services, announced the official launch of its Partnership Program, a sales-based initiative that allows individuals from outside organizations to advocate on behalf of the rapidly-growing AI provider. Program entrants are required to have deep exposure to the technology landscape and insights into organizations that will benefit from Fusemachines’ ability to offer customized artificial intelligence solutions, engineering support, and staffing along with educational training. As a participant, partners will receive the necessary collateral items and financial compensation for referrals in the form of revenue sharing. Interested applicants can reach the company regarding the program via email at partners@fusemachines.com. Fusemachines is a premier provider of AI talent to companies around the world. The company sources and trains AI professionals in developing countries and underserved neighborhoods using its proprietary learning and testing platform. Fusemachines connects these engineers to companies seeking AI resources. In addition, Fusemachines provides all the necessary AI training and development tools to its clients to build and implement AI systems.